The BlackBerry Desktop Redirector app must be running and connected to a Microsoft® Exchange account via an active Internet connection in order for email redirection to occur. The BlackBerry Desktop Redirector app must be started manually. If desired, to start the app automatically upon system startup, a shortcut to the app can be placed in the Windows Startup folder. For new installations, refer to Configure Email Services - New Installation - BlackBerry® Desktop Redirector. Navigate: Start > (Settings) > Control Panel > (Programs) > Programs and Features. Si se te solicita, haz clic en Continuar. Navigate: Start > (Settings) > Control Panel > Add or Remove Programs. 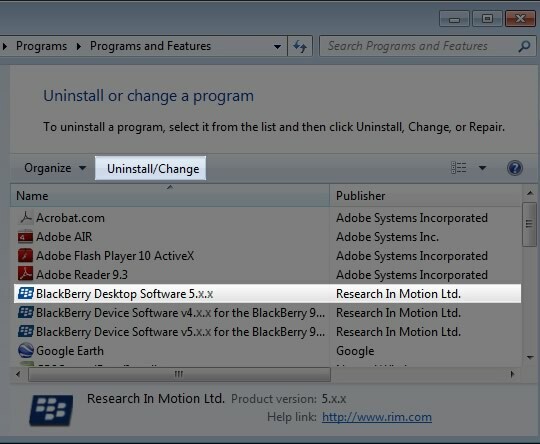 Select BlackBerry Desktop Software then click Uninstall/Change. From the 'Welcome to the InstallShield...' screen, click Next. Ensure 'Modify' is selected then click Next. From the 'Custom Setup' screen, click Next. Ensure the desired Media Options are selected (checked) then click Next. Selecciona Integrate with a work email account, luego haz clic en Next. Ensure 'for Microsoft® Exchange (typically used with Microsoft® Outlook)' is selected then click Next. Ensure the desired Installation Options are selected (checked) then click Install. Start BlackBerry Desktop Manager automatically each time the computer starts. Create a shortcut for BlackBerry Desktop Manager on the Windows® desktop. Asegúrate de que el dispositivo BlackBerry esté conectado a la computadora a través de cable USB provisto, luego haz clic en Email Settings. If BlackBerry Desktop Manager is not open, navigate: Start > All Programs (Programs) > BlackBerry > Desktop Manager. From the 'Email Settings' prompt, click Yes. Sigue las instrucciones en la pantalla para generar una nueva clave codificada. From the 'Email message redirection' section, ensure 'Forward incoming messages...' is selected (checked) then click Apply (located in the lower-right). Navigate: Start > All Programs (Programs) > BlackBerry > BlackBerry Desktop Redirector.